WHAT IS BURIAL INSURANCE? Burial insurance is life insurance. Marketed in small amounts designed to cover end-of-life expenses. It serves a niche market with those who have few needs other than making sure they have money set aside to cover funeral expenses. Whole life insurance builds cash value, unlike term insurance which does not. Because it is sold in small amounts, there are generally not a lot of hoops to jump through. Many companies do not require physical exams or blood tests. Instead, they ask a few simple questions. Some agencies may have a pre-defined waiting period for a pre-existing condition, but would typically cover other conditions. WHO NEEDS BURIAL INSURANCE? This insurance is designed to fill a gap. It is for those who have no other plans in place, and who simply want to make sure that they are not a burden on their loved ones. Those who seek this coverage generally are not raising children, paying mortgages, putting kids through college, or trying to build a portfolio for their heirs. If you are reading this, and you are going through any of these other situations, you may want to consider more insurance than simply burial insurance. If you already have plenty of coverage, that money will be used for this purpose. You don’t need to purchase a separate policy. Purchasers of burial insurance may have had coverage through employment, which may have ended when their employment was terminated. They may have cashed in a policy or let it lapse. Their needs or financial situation may have simply changed. 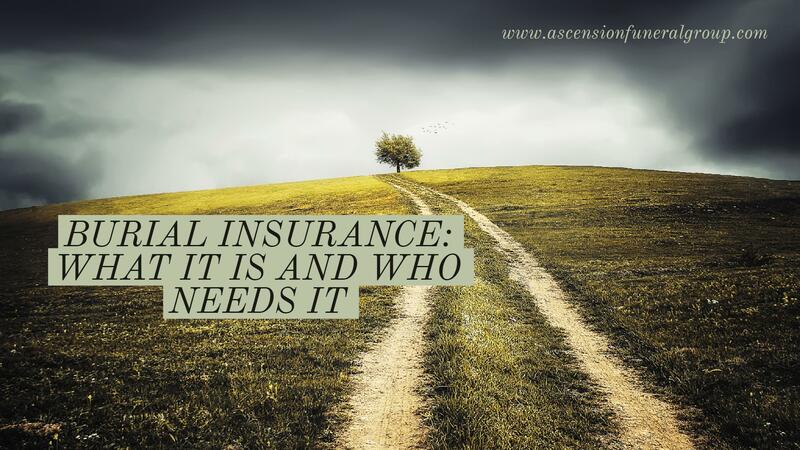 PRE-PLANNING AND INSURANCE GO HAND IN HAND: The one thing that doesn’t change that we can all count on, is that sooner or later, someone will take care of our last wishes. Pre-planning your funeral allows you to have a say in what happens at that time. Whether you desire burial or cremation, by pre-planning, your wishes will be carried out in the manner you desire. You may want to specify how a service is conducted, if you even wish to have one. You also have the right to specify your beneficiary. So if you have a trusted family member or friend who will care for your needs, you may designate them. However, if you would rather assign it to the funeral home you have chosen, you may also do so. This way, you are certain that it is used for the purpose in which you intended it. Any remaining amount will be handed over to your assigned beneficiary after services. Purchasing burial insurance with the specific intention of covering those needs is a responsible way to lift the burden from the loved ones left behind. If you are just now considering your options, and would like to talk to someone or ask questions, please call Ascension Funeral Home today for an appointment. We will be happy to sit down with you and assure that you are comfortable with the answers you need.